Walden Pond is a wonderful stone-built cottage set two miles from Par in southern Cornwall. With a heart-warming interior and superior coastline and countryside at your doorstep, this is a fine choice for a getaway with your loved ones. When you're not out exploring this tremendous surrounding area, put your feet up in the comforting sitting room, home to two comfortable sofas and a dining table set for four. The kitchen is well-equipped and is complete with fresh white units. One of the property's two bedrooms situates itself on the ground floor, an inviting twin room which benefits from flexible zip/link beds and is touched with charming coastal features. A lovely family bathroom also sits downstairs. The staircase takes you up to an open double bedroom, enhanced with rustic wooden floorboards and the thoughtful coastal theme continues. A magical garden area rests to the back of the cottage, with half an acre of wooded gardens and a patio area, it is a fine spot to take yourself for a soothing stroll, or sit out and enjoy a barbecue with your loved ones. Par is a tranquil coastal destination, offering a small range of amenities and a heavenly, sandy beach to make the most of. A handful of popular Cornish destinations are easily accessible from here including Fowey and St Austell, both promise a fabulous day trip. Come and enjoy the lovely Walden Pond for a much-deserved break by the sea. Two bedrooms: 1 x double, 1 x ground floor twin (zip/link, can be double on request). Ground floor bathroom with bath, shower over, basin and WC. Kitchen. Sitting room with dining area and woodburner. Note: Young children should be supervised when in the garden. Fowey 4 miles; Charlestown 4 miles; St. Austell 5 miles. Par village is located on the South Cornwall coast offering a sandy family and dog-friendly beach (dogs allowed all year round) on St. Austell Bay. The village is only 2.5 miles away from the internationally renowned Eden Project, which can be reached on foot through the leafy green Luxulyan Valley. Between Par and the picturesque harbour of Fowey, is the Gribbin Peninsula, which has magnificent views of the surrounding coastline and makes for an excellent walk. Close to Par are many places connected to the author Daphne du Maurier, including the small cove at Polkerris which boasts the Rashleigh Arms and which takes its name from a local landowner whose house was frequented by the author. There are many attractions in the area including the China Clay Country Park, Charlestown Shipwreck Museum and the Lost Gardens of Heligan. 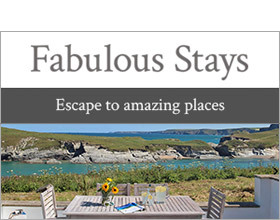 A fabulous location to explore the rich heritage and magnificent coastline of South Cornwall.